West Nile virus (WNV) is a mosquito-borne flavivirus that causes mild to severe illness. It was first identified in Uganda in 1937. WNV was first introduced to the United States in 1999 in New York and reached Florida in 2001. Since its initial detection, human cases of WNV have been reported in all U.S. states with the exception of Alaska and Hawaii. The virus is now considered endemic in the U.S., with annual epidemics in some parts of the country, peaking in the late summer months. Disclaimer: This video is free for the use of the public and media. Most West Nile virus infections (approximately 80%) are asymptomatic. In those people that do develop symptoms, most experience a mild illness termed West Nile Fever (WNF) that is characterized by headache, fever, pain, and fatigue. Less than 1% of infected people develop the most severe form of disease, neuroinvasive WNV, which may involve meningitis and encephalitis and can cause irreversible neurological damage, paralysis, coma or death. Symptoms typically appear between 2 and 14 days after the bite of an infected mosquito. People over the age of 60 and individuals with weakened immune systems (especially transplant recipients and HIV infected individuals) seem to be at increased risk for severe disease. There is no specific treatment for WNV, and most mild infections are typically overcome with little or no medical intervention within a matter of weeks. An effective vaccine has been developed for horses, however research for a human vaccine continues. The peak period of transmission in Florida is July through September. Since its introduction, WNV activity has been identified in all 67 of Florida's counties. After the 2003 peak, the number of human cases gradually decreased over the years from 2004 to 2009 until it started showing an increase in the number of cases in 2010. Dry environmental conditions and herd immunity in bird populations may have contributed to the low number of cases during 2006-2009. The natural cycle of WNV involves several species of Culex mosquitoes and wild birds. It can cause high rates of mortality in certain families of birds, especially crows and jays. Occasionally, an infected mosquito will bite a human or animal (particularly horses) and cause disease. The virus can also be transmitted to humans via contaminated blood transfusions and a few cases have also been reported involving intrauterine transmission. Since 2003, all blood donations are screened for the presence of WNV prior to transfusion. 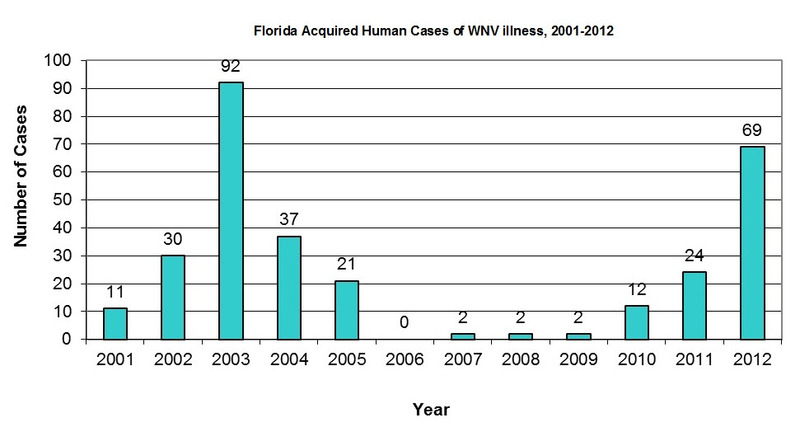 2012 represents the second highest year of record for WNV illness in Florida focused in Duval County and the Panhandle. 2012 also saw a national outbreak of WNV illness with the highest number of cases reported since the 2003 peak. The state of Texas reported 33 percent of all WNV illness cases with all lower 48 states reporting activity. The 2012 outbreak likely resulted from many factors, including higher-than-normal temperatures that influenced mosquito and bird abundance, viral replication in host mosquitoes, and interactions of birds and mosquitoes. West Nile virus (WNV) illness is a disease that can be spread to people and animals through the bite of an infected mosquito. The virus can cause potentially serious illness and even death in people. Experts believe WNV is well established in North America including Florida, with the most activity reported in the summer and fall months. This fact sheet contains important information that can help you prevent WNV illness. What Can I Do to Prevent WNV infection? The easiest and best way to avoid WNV illness is to prevent mosquito bites. The best preventive measures are to Drain standing water to prevent mosquito breeding around your home or business, Cover doors and windows to keep mosquitoes outside of homes and Cover skin with clothing or mosquito repellant to prevent mosquito bites. CLOTHING - If you must be outside when mosquitoes are active, cover up. Wear comfortable shoes, socks, long pants and long sleeves. REPELLENT – Apply mosquito repellent to exposed skin and clothing. Always use repellents according to the label. Environmental Protection Agency (EPA) registered repellents with 10-30 percent DEET, picaridin, IR3535, and some oil of lemon eucalyptus and para-menthane-diol products provide longer-lasting protection. Permethrin repellent can also be applied to clothing (but not skin). Keep mosquitoes out of your house. Repair damaged screening on windows, doors, porches, and patios. What Are the Symptoms of a WNV infection? Serious Symptoms. About one in 150 people infected with WNV will develop severe illness. The severe symptoms can include high fever, headache, neck stiffness, stupor, disorientation, coma, tremors, convulsions, muscle weakness, vision loss, numbness and paralysis. These symptoms may last several weeks, and neurological effects may be permanent. Severe illness can also result in death. Milder Symptoms. Up to 20 percent of the people who become infected have symptoms such as fever, headache, and body aches, nausea, vomiting, and sometimes swollen lymph glands or a skin rash on the chest, stomach and back. Symptoms can last from a few days to several weeks. No Symptoms. Approximately 80 percent of people who are infected with WNV will not show any symptoms at all. Most often, WNV is spread by the bite of an infected mosquito. Mosquitoes become infected when they feed on infected birds. Infected mosquitoes can then spread WNV to humans and other animals when they bite. WNV is not spread through casual contact such as touching or kissing an infected person. People typically develop symptoms between 2 and 14 days after they are bitten by the infected mosquito. There is no specific treatment for WNV infection. In cases with milder symptoms, people experience symptoms such as fever and aches that pass on their own, although it may take several weeks to fully recover. In more severe cases, people usually need to go to the hospital where they can receive supportive treatment including intravenous fluids, help with breathing and nursing care. What Should I Do if I Think I Have WNV illness? Contact your health care provider if you think you or a family member might be ill due to WNV infection. What Is the Risk of Getting Sick from WNV infection? Anyone living in an area where WNV is present can be infected and experience serious illness. The more time you're outdoors, the more time you could be bitten by an infected mosquito. Pay attention to preventing mosquito bites if you spend time outside, either working or playing. Serious illness can occur in people of any age. However, those over 60 years of age are at increased risk for severe disease. People with certain medical conditions, such as cancer, diabetes, hypertension, kidney disease, and people who have received organ transplants or who have a weakened immune system, are also at greater risk for serious illness. Qué es el virus del Nilo Occidental (West Nile Virus, WNV por sus siglas en Inglés)? El virus del Nilo Occidental (WNV por sus siglas en Ingles) es un virus que puede ser transmitido a las personas y los animales a través de la picadura de un mosquito. El virus puede causar una enfermedad potencialmente seria e incluso la muerte en algunas personas. Expertos creen que el WNV está bien establecido en Norteamérica, incluyendo la Florida, con la mayor actividad reportada en los meses del verano y otoño. Este hoja de datos contiene información importante que puede ayudarle a prevenir el WNV. Qué puedo hacer para prevenir la infección del WNV? La mejor manera, y la más fácil, de evitar el WNV es prevenir las picaduras de mosquitos. Las mejores acciones preventivas son, Drene agua que se haya podido acumular alrededor de su casa o negocio para evitar que los mosquitos se multipliquen, Cubra las puertas y ventanas para mantener los mosquitos afuera,de su casa y Cubra su piel con ropa o repelente contra mosquitos para prevenir sus picaduras. Drene el agua de los basureros, baldes, cubiertas para piscinas, neveras portátiles, juguetes, maceteras o cualquier otro recipiente en donde el agua de lluvia o de riego se pueden acumular. Llantas viejas, barriles, botellas, latas, ollas y sartenes, electrodomésticos rotos y otros objetos que no se están utilizando. Vacíe y limpie las fuentes de agua y los platos de agua para mascotas por lo menos una o dos veces a la semana. Proteja de la lluvia los barcos o lanchas, y sus vehículos con lonas impermeables que no acumulen agua. Mantenga las piscinas en buenas condiciones y adecuadamente clorinadas. Vacíe las piscinas plásticas cuando no se este usando. ROPA: si debe estar afuera cuando los mosquitos están activos, cúbrase la piel. Use zapatos, calcetines, pantalones largos y camisas manga larga. REPELENTE: aplique repelente contra mosquitos sobre la piel y la ropa. Siempre utilice los repelentes de acuerdo con las instrucciones en la etiqueta. La Agencia de Proteccion Ambiental (EPA por sus siglas en Ingles) ha registrado los repelentes con 10 a 30% de DEET, picaridin, IR3535, y algunos repelentes a base de aceite de eucalipto limón, y productos con para-metano-diol como productos que ofrecen protección mas duradera. Permetrin se puede aplicar a la ropa (pero no a la piel). Use mosquiteros para proteger a los niños menores de 2 meses de edad. Mantenga los mosquitos fuera de su casa. Repare las mallas rotas en ventanas, puertas, porches y patios. ¿Cuáles son los síntomas una infección del WNV? Síntomas leves. Hasta el 20 por ciento de las personas que se infectan tienen síntomas como fiebre, dolor de cabeza, dolor de cuerpo, náuseas, vómitos y algunas veces glándulas linfáticas inflamadas o erupción en el pecho, estómago y espalda. Los síntomas pueden durar desde unos días, a varias semanas. Ningún síntoma. Aproximadamente el 80 por ciento de las personas que se infectan con WNV no presentaran ningún síntoma. ¿Cómo se propaga el virus del WNV? Con más frecuencia, el WNV se propaga por la picadura de un mosquito infectado. Los mosquitos se infectan cuando se alimentan de aves infectadas. Los mosquitos infectados pueden propagar el WNV a los humanos y otros animales cuando los pican. El WNV no se propaga a través del contacto casual como tocar o besar a una persona infectada por el virus. ¿Qué tan rápido se enferman las personas infectadas del WNV? Por lo general, las personas desarrollan síntomas entre 2 a 14 días después que fueron picados por el mosquito infectado. ¿Cómo se trata la infección del WNV? No hay un tratamiento específico para la infección del WNV. En casos con síntomas más leves, las personas experimentan síntomas como fiebre y dolores que pasan por sí solos, aunque algunas personas pueden tardar varias semanas en recuperarse. En los casos más graves, las personas usualmente tienen que ir a un hospital donde puedan recibir tratamiento, incluyendo líquidos intravenosos, ayuda con dificultades respiratorias y cuidados medicos. ¿Qué debo hacer si creo que tengo WNV? Contacte a su medico, o proveedor de salud, si piensa que usted, o un familiar suyo, pudiera estar enfermo con el WNV. ¿Cuál es el riesgo de enfermarse de WNV? Cualquier persona que viva en un área en donde el WNV esté presente puede infectarse y sufrir una enfermedad severa. Entre más tiempo pase fuera de casa, mayor es el riesgo de ser picado por un mosquito infectado. Preste atención y prevenga picaduras de mosquitos si usted permanece afuera, ya sea trabajando o divirtiéndose. La enfermedad severa puede ocurrir en personas de cualquier edad. Sin embargo, personas mayores de 60 años tienen más posibilidades de desarrollar una enfermedad severa. Personas con ciertas condiciones médicas como, cáncer, diabetes, hipertensión, enfermedad renal, personas que han tenido trasplantes de organos, o personas que tengan un sistema inmunologico debilitado, están en mayor riesgo de sufrir una enfermedad severa.